Crucial Compression Socks provide you with comfortable support, where you need it most. Experience unmatched quality and comfort. You may even forget you're wearing them - but your feet and legs won't. Take advantage of modern sport technology. 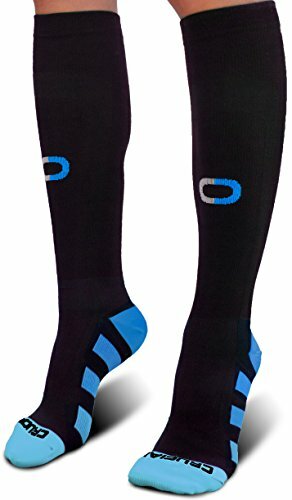 Now you can perform better with the same compression technology worn by professional runners, nurses, and athletes. Don't let your fatigue and pain hold you back. Simply slide your foot in and pull up to get instant support and snug compression for your legs, calves, ankles, and feet. Tired, hurting legs and feet need extra love. Utilize compression to speed up your recovery. Don't go another day without experiencing the benefits of compression! ✅ INSTANT STAMINA AND RECOVERY BOOST - You will feel the difference immediately. Durable, professional-grade graduated compression socks (20-30 mmHg) provide the perfect amount of compression - exactly where you need it. Our Power Support technology improves circulation to provide more oxygen and blood flow through your toes, feet, heels, calves, and legs up to your knee. Now you can go harder, for longer, with fast recovery to push yourself through the extra mile. Your legs deserve it! ✅ ULTRA SOFT AND COMFORTABLE - Some compression stockings are too hot, too tight, itchy and impossible to get on. Our Premium ComfortFlex design is carefully constructed with quality double stitching to provide a sung, moisture wicking, lightweight and breathable fit that doesn't slip down or cut off your circulation. Easy to slip on - so you can get the support you need without restricting your movement. Fall in love with comfortable relief for your legs and feet. ✅ STYLE AND CONFIDENCE FOR YOUR LEGS - With unmatched quality lycra and long-lasting durability, our performance compression socks will take you wherever you need to go in style - we guarantee it. Reinforced, shock absorbing toe and heel cushion and moisture wicking fabric will help you push through whether you're on your feet all day at work, running a half marathon, or stuck on a long flight. Stop suffering and start feeling great. Your feet and legs will thank you! ✅ INCREDIBLE PERFORMANCE - Easy to get on and great for daily wear, Crucial Compression hose is beneficial for men and women who need comfortable lasting vascular support to relieve pain, reduce fatigue, swelling, edema, diabetic, and prevent blood clots after surgery. Grab a few pairs for yourself or as the perfect gift idea for runners, nurses, athletes, airplane travelers, crossfit workouts, hiking, cycling, or anyone else who would love a comfort boost for their legs and feet! ✅ 100% "PERFECT FIT" GUARANTEE - Your health and comfort is our passion! Why settle for anything less than the best? Use our size chart to choose the perfect fit. If you are not completely satisfied with your premium quality compression socks, return them for a full refund or replacement. No questions asked. We stand behind the quality of our products with excellent customer care and are confident you will LOVE your compression socks. If you have any questions about this product by Crucial Compression, contact us by completing and submitting the form below. If you are looking for a specif part number, please include it with your message.